This work by Jonas Staal - described as an exhibition project - analyzes and deconstructs the mechanisms of contemporary propaganda art and raises the question of how to create possible counter-narratives in the form of an “emancipatory propaganda art”. Steve Bannon: A Propaganda Retrospective is on show from April 20 until September 23, 2018. Stephen K. (Steve) Bannon is best known as campaign manager and later senior White House Advisor of US President Donald Trump, as well as former editor-in-chief of Breitbart News. Less well known is Bannon's work as a filmmaker, producing nine documentary film-pamphlets between 2004 and 2016. From In The Face of Evil (2004) to his most recent film Torchbearer (2016), Bannon sketches a grim profile of a world on the brink of disaster, beset by economic crisis, secular hedonism and Islamist fundamentalism. Bannon describes his work as a form of “kinetic cinema”, which, as he puts it, “aims to overwhelm an audience,” and is inspired by the work of Sergei Eisenstein, Leni Riefenstahl, and Michael Moore. His films explicitly showcase the manifold dangers faced by his ideal of Christian free-market nationalism. In Bannon’s films, "strong" leaders such as Ronald Reagan, Sarah Palin, and Donald Trump, emerge as the sole defenders of Christian faith, military might, family values and economic nationalism. Looking back, it can be argued that what is now known as “Trumpism” was decades in the making in Bannon’s propaganda work. Staal’s artistic practice and long-term research on contemporary propaganda art serve as a guide to understand Bannon’s artistic development. Starting from Bannon’s early Hollywood-inspired rap musical The Thing I Am and his work as director of the Biosphere 2 project aimed at mapping the consequences of climate change in the 1990s, visitors witness the awakening of his political conscience after the attacks of September 11, 2001. At this point Bannon becomes a filmmaker and campaigner for the Tea Party and the international alt-right. Through five different rooms, Staal shows how Bannon’s artistic imagination contributed to the political reality of the Trump presidency. In Staal’s perspective, Bannon’s work provides a crucial example of the major impact of propaganda art on contemporary democratic societies, that is not exclusive to the United States, but equally manifests itself throughout Europe in the form of ultranationalist and alt-right movements and political parties from the Netherlands to Italy. This exhibition project dissects and reflects upon the spaces, forms of display, strategies for circulation, and techniques of contemporary propaganda, using Steve Bannon’s work as a case study. As Staal suggests, following Angela Nagle’s Kill All Normies (2017), the alt-right is not simply a political movement, but is above all a cultural one that permeates the larger realm of politics, media, and popular discourse. The ambition of Steve Bannon: A Propaganda Retrospective is, therefore, to offer an understanding of the effects of the visual and ideological architecture of the alt-right to a broad audience in order to provide new insights and opportunities for critical reflection and resistance. In its multiple programs, Het Nieuwe Instituut addresses some of the most pressing questions affecting contemporary society, in which art, design, architecture, and digital culture play a key role. The contemporary world is increasingly shaped by the volume and speed at which information circulates and dominant narratives are construed, making it imperative to challenge through artistic, speculative, and academic research, what Walter Lippmann described as the “pseudo-realities” of our limited information bubbles. Jonas Staal is an artist and propaganda researcher, who has extensively worked on the role of art, architecture, and design in the rise of ultranationalism and the international alt-right. 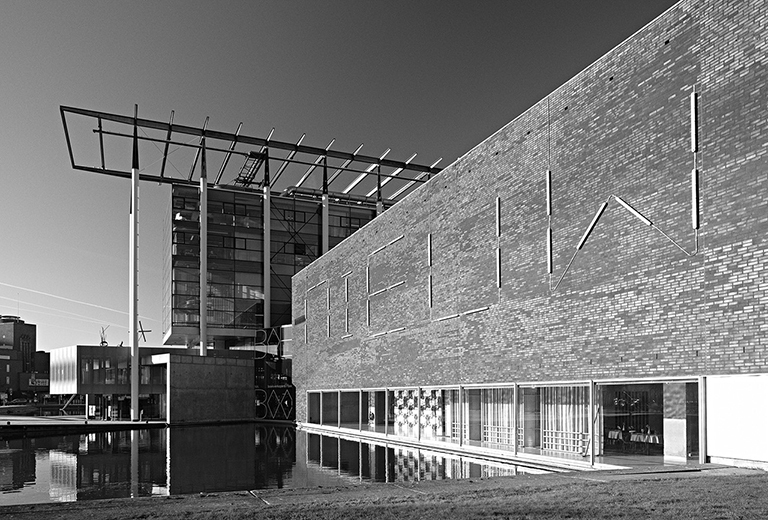 In 2010, he reconstructed the so-called Freethinkers’ Space in the Van Abbemuseum in Eindhoven, a copy of an exhibition space founded by the Freedom Party (PVV) and the People’s Party for Freedom and Democracy (VVD) in their parliamentary offices in The Hague, showcasing artists who were supposed victims of Islamist censorship. In 2011 he presented Closed Architecture, a publication, exhibition, and film on a prison model designed by PVV politician Fleur Agema before she entered politics. In 2018 Staal completed his PhD research Propaganda Art from the 20th to the 21st Century as part of the PhDArts–Promoveren in de Kunsten program at Leiden University. Staal lives and works in Rotterdam and Athens. On Thursday April 19 Steve Bannon: A Propaganda Retrospective will officially open with a Thursday Night Live! programme. During the opening, Jonas Staal and Marina Otero Verzier will engage in a public discussion on alt-right and ultranationalist propaganda art with design collective Foundland's Lauren Alexander and NIDA politician Nourdin el Ouali, moderated by journalist and writer Chris Keulemans. On June 2, 2018, an international conference titled Propaganda Art Today will bring together artists, activists, theorists, writers, journalists, and politicians, to map the multitude of propagandas that shape our world today. For a press preview, an appointment and/or an interview with the artist or curator, please contact the Press Office. For more information or images, please contact Yev Kravt, via email: y.kravt@hetnieuweinstituut.nl or telephone: +31 (0)6 83 67 97 37.